I've seen my share of ill-advised remakes. "Halloween." "Psycho." Two unnecessary retreads of "King Kong." But they're nothing compared to what lurks on the horizon for next year. That's when MGM plans to unleash its remake of 1984's "Red Dawn." 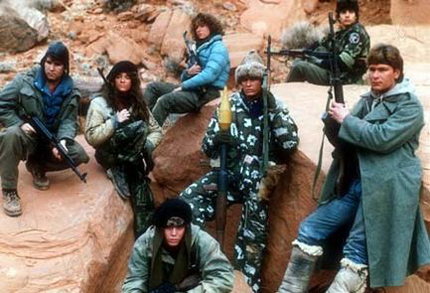 The original "Red Dawn" has aged about as well as legwarmers, Aquanet hair and pre-ripped jeans. The movie's plot can best be described as "The Breakfast Club" meets "Invasion U.S.A." And by "Invasion U.S.A.," I mean either the 1952 Red Scare flick about godless commies descending on America or the 1985 Chuck Norris movie about godless commies descending on America. Take your pick. "Red Dawn" opens with the Russians and Cubans invading the U.S. Afterward, it's up to a bunch of high school students to mount a resistance. Along the way, they get training from a downed Air Force pilot played by Powers Boothe, which allows them to stage guerrilla raids and fight their way to friendly territory. The movie is best known for launching the careers of Patrick Swayze, Charlie Sheen and C. Thomas Howell. OK, let's be honest about that. C. Thomas Howell hasn't had much of a career. But that's what he gets for agreeing to star in "Soul Man." Anyway, back when Ted Turner still controlled TBS, rumor had it that he personally programmed the channel by spinning a big wheel with movie titles printed on it. Then he'd air whichever movie the arrow landed on. Unfortunately, the wheel listed the titles of only three movies: "Beastmaster," "Roadhouse" and "Red Dawn." Now, it could be that I'm the person who started that rumor. That's neither here nor there. The point is, "Red Dawn" aired on TBS a lot when I was a teenager. "Red Dawn" is written and directed by John Milius, who also gave us Arnold Schwarzenegger in "Conan the Barbarian." As one of Hollywood's few out-of-the-closet conservatives, Milius apparently decided that it was his duty to make an anti-communist movie that was every bit as paranoid and absurd as the anti-business and anti-nuclear movies Hollywood was churning out at about the same time. Seven years later, the Soviet Union would be gone. But "Red Dawn" would still be on cable TV and still taking itself way too seriously. But for all of its dreary, depressing earnestness, "Red Dawn" is now a cult favorite, which is probably why someone at MGM thinks it is prime remake material. There's just one tiny, little problem. The Soviet Union is no more. It has ceased to be. It has expired and gone to meet its maker. It is an ex-country. But never fear. There still is one Big Bad out there to serve as the heavy — China. According to a review of the remake's script, the new "Red Dawn" has the Chinese invading the U.S., with the Russians coming in later to back them up. So, basically, China is the new Soviet Union and Russia is stuck with the role of Cuban flunky. My, how the Russian Bear has fallen. The irony here is that the new "Red Dawn" is probably being shot with camera equipment made in China. And that brings up another glaring flaw with this remake. As unlikely as a Soviet invasion of the U.S. was in 1984, a Chinese invasion in 2010 is even more farfetched. I'm pretty sure we never bought movie equipment from the former Soviet Union, but we buy almost everything from China. Last year alone, the U.S. and China did $409 billion worth of business with each other, with China racking up a $266 billion trade surplus, which it then used to buy a sizable chunk of U.S. debt. China is far more likely to turn us over to a bill collector than invade. And that might be worse. Think of all the harassing phone calls. What would the movies be without screams? The thought of it is almost too terrible to entertain. It's like imagining Sonny without Cher, Oats without Hall or Garfunkel without Simon. And we don't have to imagine any of those. We know exactly how bad they are. Often, screams make the movie, especially horror movies, where bloodcurdling screams of sheer, abject terror are a necessity. A subset of Hollywood actresses is even known for their ability to scream on screen. "Scream queens," they're called. But one scream has taken on a life of its own. You've heard it. In fact, you've heard it probably dozens of times, even if you've never heard of it. Among Hollywood sound editors, the scream is legendary. It even has a name. It's the Wilhelm scream. The Wilhelm scream was originally recorded for "Distant Drums," a 1951 Warner Bros. film starring Gary Cooper. It makes its debut when a character is eaten by an alligator. The scream is, needless to say, distinctive. Unfortunately it's impossible to get across in print. But I'll try. It goes something like "aaaaAAAAuuuuhhhh!" If, however, you prefer a more lifelike — or, in this case, death-like — example, an audio file of the scream is available on the Wilhelm scream's Wikipedia page. The scream didn't get its name until its second appearance, in the 1953 Western "The Charge at Feather River." In that film, an arrow strikes a minor character, named Wilhelm, in the leg. Wilhelm, of course, screams, as people with arrows in their legs tend to do. The rest, as they say, is history. 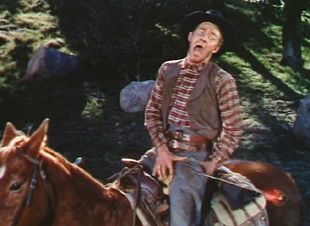 Today, the Wilhelm scream is more famous than either of the first two movies in which it appeared. A band is named after it, YouTube videos celebrate it and nearly 150 movies feature it in one way or another. And the list is growing. I was reminded of the Wilhelm scream last weekend, as I was indulging in a marathon viewing session of the British sci-fi series "Primeval," which is currently airing on the Sci-Fi Channel. Wilhelm gives a big shout-out once every episode. If you're playing a "Primeval" drinking game, taking a shot whenever you hear the Wilhelm scream is a must — along with taking a shot whenever a character goes in search of a dangerous prehistoric predator without taking along a firearm. But that is another column. The Web site Hollywood Lost and Found has done an excellent job of uncovering the Wilhelm scream's history, along with cataloging the films in which the scream appears. Over the years, the Wilhelm scream has become something of an inside joke among sound editors, who insert the scream, where appropriate, as a way of saying "hi!" to their peers. At first, the scream appeared only in Warner Bros. films, but by the 1970s it was seemingly everywhere. It's used in the "Star Wars" films and the "Indiana Jones" movies. You say you have a Nazi falling out of a truck and onto the hood of a jeep? That sounds like a job for the Wilhelm scream. A stormtrooper falling down a Death Star shaft or an alien falling into the Sarlacc pit? That calls for a Wilhelm scream. In space, no one can hear you scream. Unless it's a Wilhelm scream. Cropping up mostly when movie characters fall from great heights or die in explosions, the Wilhelm scream, unlike those characters, refuses to stay down. And sometimes it even shows up in a situation like the one for which it was originally intended. In "Indiana Jones and the Temple of Doom," the third and final time the Wilhelm scream appears is when the villain is eaten by alligators. The scream has been a part of films as diverse as "Kill Bill, Vol. 1" (in which it appears at least twice during the same fight scene) and "Toy Story" (Buzz Lightyear knocked through a window). But what of the man who recorded the scream in the first place? No one knows for sure, but the best evidence suggests the real-life "Wilhelm" was Sheb Wooley, who is best known for the song "The Purple People Eater." I bet if someone were eaten by a Purple People Eater, the last thing out of that person's mouth would probably sound like a Wilhelm scream. Assuming you live long enough, there comes a time when you suddenly realize you can't understand what the younger generation is talking about. And apparently, that works both ways. Explaining Twitter to someone who grew up with rotary dial telephones requires an answer that is longer than 140 characters. Meanwhile, whenever I explain rotary phones to someone under the age of 20, they look at me as if they think I knew Alexander Graham Bell personally. Bell died in 1922, by the way. But according to Ralph Keyes, technology isn't the only thing that leads to communication breakdowns between generations. Keyes, author of "I Love It When You Talk Retro: Hoochie Coochie, Double Whammy, Drop a Dime and the Forgotten Origins of American Speech," says people my age and older — mostly older — might as well be speaking Aramaic, as far as young people are concerned. Writing at Editor & Publisher magazine's Web site, Keyes is particularly hard on my profession, accusing us of "retrotalk," which he says is "terminology rooted in our past that may not be familiar to younger readers. Or immigrants. Or anyone at all, for that matter." Keyes picks on New York Times columnist David Brooks — admittedly, an easy target, although not as easy a target as Brooks' colleague Thomas Friedman. Brooks' sin was comparing Hilary Clinton to Howard Beale, the fictional newsman in the 1976 movie "Network," who famously said, "I'm mad as hell, and I'm not going to take this anymore!" Or maybe not so famously, Keyes thinks. But I guess he doesn't know that part of Beale's speech is an Internet hit, featured in the YouTube video "40 Inspirational Speeches in 2 Minutes." The video has racked up more than 1 million views so far. And it's nothing more than a cleverly edited inspirational speech cobbled together from inspirational speeches featured in movies spanning seven decades. Who would have thought something so retro could be so popular with all those young people who use YouTube? Keyes also cites a Miami Herald writer, who confused his editor by referring to Mayberry in a column. It seems the editor grew up in a home without a television and wanted to know where Mayberry was. Do you mean to tell me that someone actually needs to have seen "The Andy Griffith Show" to know that the fictional town of Mayberry is where the show took place? Well, Shazam! I think there are some bits of cultural knowledge people should just know, regardless of their age. After all, I've never managed to sit through "Gone with the Wind" (1939), but I do know tomorrow is another day. Sometimes, if you don't get the reference, it isn't your fault. Some writers probably are too obscure, gleefully tossing out references to dusty cultural artifacts just as Dennis Miller did during his "Saturday Night Live" years. For example, does anyone remember Dennis Miller? Anyone? Bueller? Bueller? On the other hand, is there anyone who doesn't know the origin of the phrase "Beam me up, Scotty"? If high school literature teachers think I should remember the importance of the line "To be or not to be," I should have the expectation that the average Joe on the street will know what I mean if I ask, "Where's the beef?" Especially if I ask in a crotchety old woman's voice. If, however, the phrases "Beam me up, Scotty" and "Where's the beef?" are a mystery to you, please look them up on Google. But if the word "Google" has you confused, well I can't help you with that. Explaining Google is a lot like explaining Twitter. And I just ran out of space. "Space Camp" and "The Long Walk Home" were shot in Alabama. Some of "Close Encounters of the Third Kind" was filmed here, too, although not the famous Devil's Tower sequence, obviously. But apart from "Big Fish" in 2003, it has been a while since a major Hollywood production set up shop in Alabama. The 1999 film "Crazy in Alabama," for example, stars Speake, Ala., native Lucas Black and is set in Alabama. But it was filmed in Louisiana. That sort of thing sticks in the craw of Alabama's state legislators. Not only is it an affront to the state's honor — if you care about such things — it means millions of dollars are going to states like Louisiana that are standing in for the real Heart of Dixie. And who in Alabama doesn't care about that? So, this year the Alabama Legislature finally passed an incentive package — basically a lot of tax breaks — designed to lure Hollywood producers to the state. But first, the proposal's backers had to win over the state's most powerful lobby, the Alabama Education Association. AEA had opposed previous tax breaks for the movie industry, claiming they would cost the state's education budget much-needed funding. Now, correct me if I'm wrong, but if Alabama was doing virtually no movie business before the tax breaks, and thus making almost no money off movie productions, how exactly were the tax breaks going to cost anything? Any percentage of zero is still zero. So, either someone in the AEA is pretty bad at math, which is a sobering thought, or AEA was just looking for a payoff. It's almost like a Hollywood script. "The Godfather," maybe. After all, AEA Executive Secretary Paul Hubbert is a bit like the Don Corleone of Alabama politics. He makes politicians offers they can't refuse. Well, this year AEA got its payoff, in the form of a law making it easier to tax out-of-state corporations that do business in Alabama, and dropped its opposition to the movie incentives bill, which, with the governor's signature, is now law. Now, Alabama can not only play itself in the movies, it can stand in for other places as well. In theory, it could become the South's answer to Vancouver, British Columbia, which doubles for just about everywhere. Ever see Jackie Chan's "Rumble in the Bronx"? It is set in New York City, which makes the occasional appearance of the Rocky Mountains in the background of some scenes unintentionally hilarious. But Hollywood's deep pockets weren't the only things on legislators' minds when they passed the incentives bill. Lawmakers were thinking about jobs, too. Athens State University and Calhoun Community College are moving forward with a program to train students for jobs in the movie and television business. Soon, downtown Decatur, Ala., could be home to classes that prepare young Alabamians to be gaffers, best boys and other movie professionals with strange job titles. Someone around here could be the next Steven Spielberg, or at least the next Roger Corman. This is a great opportunity. If there had been a film school around here when I graduated from high school, do you think I would have gotten degrees in economics and political science? Not a chance. But it is still good news for me because I'll need trained professionals to work on my film, "Kung Fu Biker Zombies vs. the Vampire Strippers from Hell in 3-D." Granted, I don't have a script yet, just a plot synopsis scribbled on a cocktail napkin one late night at The Brick Deli & Tavern. But I feel good about this project. And with the tax breaks Alabama is offering, I might be able to bring it in under the $30 million budget I have in mind. Sure, my original plan was for the movie to be set in Nevada, but it's not too late to make revisions for the sake of my native state. 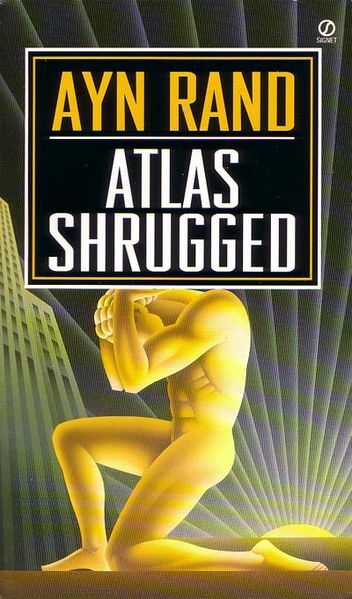 More than 50 years after its publication, Ayn Rand's bestseller "Atlas Shrugged" is again moving up the sales charts. Amazon.com's best-seller list, briefly topping President Barack Obama's "The Audacity of Hope." Renewed interest in the novel began with the economic downturn, starting with the Federal Reserve's interest rate cuts last year. Sales spikes then coincided with the mortgage and bank bailouts, and the passage of the president's economic stimulus package. Every time the economy takes a hit or the federal government grows larger, new readers flock to Rand's novel. But why, after all this time, is Atlas still shrugging? 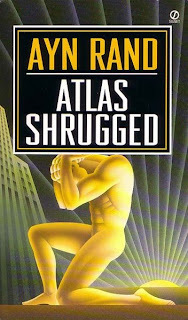 Although set in the 1950s and somewhat dated by its focus on the railroad industry, "Atlas Shrugged" still reads like dystopian science fiction, describing a near-future world on the brink of economic collapse as governments restrict, regulate and expropriate private businesses in a failed attempt to keep the system going. To a lot of people, apparently, that near future seems a lot like now. In the novel, the few businessmen, artists, thinkers and other producers who have not compromised their principles or been co-opted by the government go on a "strike of the mind." Tired of being taxed and regulated, they abandon their companies and other projects. They deprive the world of their creative talents. And, eventually, they join the book's mysterious hero, John Galt, in a secret hideaway. There, they watch as the world crumbles and plan their return, when they will rebuild along lines that respect the individual, creativity and, by implication, laissez-faire capitalism. Over the years, Rand has taken a beating both for her literary talents and her philosophy of rational self-interest, which she called Objectivism. A small number of academic philosophers treat Rand's ideas seriously, and I was a student of one of them at Auburn University in the early 1990s. But the official Objectivist movement, led by the Ayn Rand Institute, hasn't served Objectivism well, instead treating Rand's novels and essays as holy writ. Yet, as a literary figure, Rand endures, to the consternation of the literary establishment. She was born in Russia, and her novels, especially "Atlas Shrugged" and "The Fountainhead," combine the scope of Russian epics with a distinctly American pulp style. They are an odd mix of both highbrow and lowbrow sensibilities that continue to enthrall and inspire readers. Rand even weaves science fiction into her works, especially "Atlas" and her novella "Anthem," which was reprinted in a 1953 pulp sci-fi magazine. Rand's sometimes unlikely admirers include Angelina Jolie and Brad Pitt. Jolie is among the contenders to star in a movie version of "Atlas Shrugged," which is in development at Lionsgate for a tentative 2011 release. Perhaps the novel's newfound popularity will finally get the long-delayed project in front of the camera. Meanwhile, conservative pundits, particularly Michelle Malkin, are citing anecdotal cases of people "going Galt" — voluntarily reducing their income to avoid paying higher taxes. Of course, one wonders where these would-be John Galts were when President George W. Bush was increasing federal discretionary spending by nearly 50 percent. There is a bitter irony to Rand's resurgence. Most if not all of the blame for the U.S. economy's woes lies with former Federal Reserve Chairman Alan Greenspan, a former acolyte of Rand's. Many of Rand's other followers — and economists sympathetic to Rand's pro-capitalist politics — have denounced Greenspan as a sellout, some warning beforehand that his policies would lead to trouble. Certainly, the Greenspan who wrote in favor of the gold standard and against the Fed in the 1960s, when he was part of Rand's inner circle, is hard to square with Greenspan the Fed chairman. It makes you wonder if Greenspan ever imagined himself as one of Rand's villains, because he makes for a pretty convincing one.